The batch management system of farming allows strict All-in/All-out (AIAO). The AIAO management has a vast impact on the prevalence and severity of various infectious diseases, including enzootic pneumonia and PMWS. Altresyn® is ideal for synchronizing puberal gilts into an existing batch. 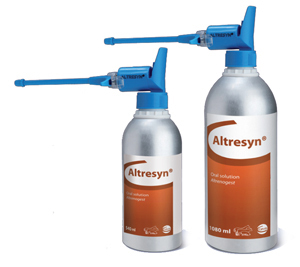 Altresyn® contains Altrenogest, which leads to suppression of the oestrus during the whole treatment. Altresyn® is the answer to your reproductive needs. An 18 day treatment regimen with Altresyn® will bring your gilts into heat within 3-6 days of completion, thus facilitating heat synchronization and batch management. Oral solution. Altrenogest 4.00 mg. Excipients: Butylhydroxyanisole (E320) 0.07 mg. Butylhydroxytoluène (E321) 0.07 mg.
Pigs (sexually mature gilts). For the synchronization of oestrus. Do not administer to pregnant animals or lactating animals or those suffering from uterine infection. Ensure the correct dose is administered daily as under-dosing can lead to the formation of cystic follicles. Special precautions to be taken by the person administering the veterinary medicinal product to animals. Avoid skin contact with the product. Pregnant women and women of childbearing age should avoid contact with the product or should exercise extreme caution when handling this product. Accidental spillage on the skin should be washed off immediately with soap and water. Seek medical advice. Oral use. 20 mg Altrenogest (5 mL) per animal once a day for 18 consecutive days. Animals should be segregated and dosed individually. Add the product as a top dressing to the feed using the metering pump. Container or 1080 mL and 540 mL non-pressurized containers. Protect from sunlight and do not expose to temperatures exceeding 50 °C.